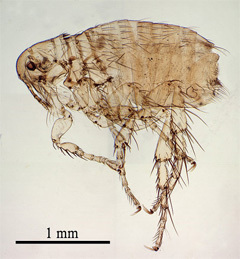 Dog fleas (also known as ‘the troll’) are a species of flea that feed primarily on the blood of dogs, though they will also feed on cats and occasionally humans. One of the main worries with dog fleas is that they can spread a parasitic tapeworm called ‘Dipylidium Caninum.’ Dogs with fleas easily transfer their fleas to other pets or can cause infestations in homes. Dog fleas are found mostly in Europe. It is important to note that, if your dog has fleas, they are very likely to be cat fleas. Cat fleas are not picky about their hosts and are found around the world. Both dog and cat fleas are agile creatures and can easily spread between dogs. If your dog has fleas, one of the easiest ways to tell is by looking for flea feces. These small dark brown spots that look much like dirt will often be found on your dog’s skin (particularly in the stomach area). If you mix one of these spots with water and crush it and it becomes red (make sure to do this with protective gloves), then you can be mostly sure that your dog has fleas. This occurs because flea feces contains dried blood inside of it. In addition, you can use a flea comb to search your dog’s skin and hair for fleas and flea dirt. If your dog is showing symptoms of flea bites, but you cannot find fleas, one of the simplest methods of diagnosis is simply to treat for fleas and see if the symptoms stop. One method that has been suggested to find out if your dog has fleas is to place it over a white sheet or piece of paper and comb it with a very fine comb. If fleas or little black (flea feces) or white (flea eggs) specks fall onto the paper, then your dog likely has fleas. If your dog has fleas, they will feed on him, and your dog will likely become symptomatic. Fleas can be uncomfortable and dangerous for dogs by causing serious itching, inflammation, and skin infection. Dog Flea bites leave small red bumps that can cause multiple forms of irritation. These bumps are often raw and bloody. They can also have puss oozing out of them. Your dog will most likely begin chewing and scratching non-stop. Dogs have very sensitive skin and can feel fleas on them. The fleas feed extremely often, and your dog may become obsessed with cleaning itself. This can lead to allergies and hair loss. This behavior can in turn lead to rashes and infections. It is therefore important to treat dog fleas as soon as you have identified them. 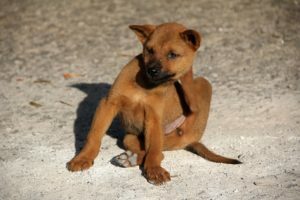 In serious cases, due to frequent feeding, dog flea bites can cause anemia; particularly in puppies and small dogs. In addition, as previously mentioned, fleas can pass tapeworm to dogs and their owners. Dog fleas tend to bite around the tail, neck, and head. Dogs that are allergic to the fleas’ saliva (flea allergic dermatitis) will have more exaggerated effects. The following are the common symptoms of flea infestation on dogs. Excessive rubbing – A dog could have fleas when they continuously rub themselves against something. Especially when one or more of the other symptoms are also present. Excessive Biting – Dogs often bite at their legs, hind end, and the tail, which cause them to get irritable, and restless. Please keep in mind that the biting also leads to scabs and scaling. Excessive chewing – Constant chewing at the fleas causes dogs to chew at their own skin which leads to open, oozing sores. Excessive licking – The constant licking stains the dog’s fur, hair loss occurs and that results in broken fur. Flea Allergy Dermatitis – This occurs when dogs are allergic to fleas, which is a common factor especially in America. Odors – The flea bites cause infection, which in turn leads to odors. Flea Collars- these collars are available in most pet stores and, though not fail-proof, are fairly effective at keeping fleas off of your dog’s coat. These collars release chemicals that deter fleas. Be sure to consult both the packaging and a veterinarian, as the wrong flea collar can be dangerous for your dog. Topical treatments- those can be applied to your dog and are available from most local pet stores or from your veterinarian. Frontline and Advantage are two of the primary brands of topical flea treatment. The treatment should be placed according to the instructions on the packet in between your dog’s shoulder blades. This is done to keep the dog from licking the medication. Powders are also available and work in much the same way however can cause skin irritation in many dogs. Topical ointments are preferred. 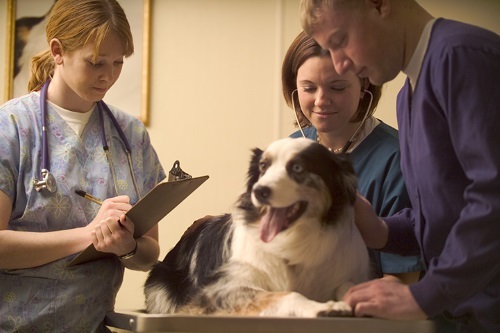 Consult your vet– Your veterinarian can also offer you oral medications for your dog. These are useful in situations that have are more developed. Oral medications stop flea larvae from being able to grow and stop the fleas’ life cycle. Flea Shampo– A good method both for treating your dogs’ fleas and for easing his symptoms is bathing him with a specialized flea shampoo. Make sure when you get the shampoo that it is designed to kill fleas, not just help remove them. Scrub your dog in the shower with the shampoo. Make sure to remove all fleas that you see. Make sure to kill any fleas that drop into the water as they can easily make it back onto your dog. Work systematically along your dogs’ body as well as a flea comb and make sure to be thorough. Flea Combs- flea combs are good at removing fleas but will by no means constitute a complete treatment. They should be used along with other treatments such as those meant before. Regular baths– a cool bath will not get rid of all of the fleas, but will offer your dog relief from the itching and can reduce swelling. Hot baths can cause more inflammation and itching. Adding cornstarch to the bath can further help relieve itching. In addition, it has been suggested that sprinkling baking soda directly onto flea bites, or applying a paste of water and baking soda to the bites can help relieve itching as well. Supplements– dogs who develop hypersensitivity to flea bites may need to be taken to the veterinarian and prescribed antihistamines or steroids to treat their symptoms. The same goes for dogs that have developed infections from open wounds after too much scratching or biting. Hydrocortisone – This is an excellent steroid that reduces redness and swelling of bites. It also stops itchiness and speeds up healing. You can buy it at any drugstore and pet store. An increased appetite and water retention are the only side-effects. Environment clean- keeping a dog’s environment clean and flea-free is important in preventing infestations. If your dog has fleas and spends time inside the house or, if you or other members of the house have fleas, it may well be necessary to get rid of the fleas in your house. The most basic method to keep a dog’s living area clean is to regularly thoroughly vacuum their sleeping area (cage, pen, dog bed, etc.). Grooming- Regular grooming using a pet hair brush and inspection of your dog’s skin for small white (eggs) or black (feces) spots as well as bites can help detect fleas early on. Something you should do as soon as possible is taking steps to get rid of fleas on dogs permanently. The constant biting is unhealthy as the bites can get infected. Infections can lead to sores and hygiene is vital. You can use home treatments as well as commercial remedies. Baking Soda – Baking soda gives relief from intense itching and reduces inflammation. Take equal amounts of water and baking soda to make a paste. Rub this paste gently onto infected and affected areas. Epsom Salt – This is an excellent soothing remedy for flea bites. Add half a cup of Epsom salt into a cold bath. Soak your dog in this water for fifteen minutes and the itch will be relieved. Aloe Vera Gel – If you have an Aloe growing in your garden, it is ideal. Break the leaf and use the sticky gel that seeps out to rub on your dog’s infected areas. Antibiotic and Antiseptic creams- Not only do these creams sooth the dog’s skin, they also prevent and cure skin infections and irritations. Having a dog with fleas is bad enough. However, fleas pose more threats when your dog is infested with them. The following are some of their additional dangers. Fleas on dogs that jump to your pet cats causes a parasitic bacterial disease, called Mycoplasma haemofelis. Another very dangerous disease your cat could get is cat scratch disease which has serious symptoms like swollen lymph nodes, red eyes and lethargic. Cats carry cat scratch disease over to humans after they got it from the flea infested dog. This is a serious disease for humans as it can lead to blindness, affect the brain, internal organs, and heart.